From the outside the Riad “Ryad Dyor” which is hidden among the narrow streets of the Medina acts pretty unimpressive. But who walks through the little blue door, which opens a beautifully furnished boutique hotel. 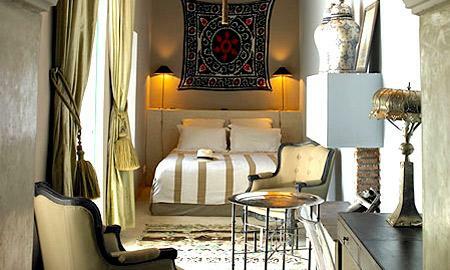 Just five suites and two rooms has a small Riad is located in the northern part of the Old Town. A refreshing pool in the courtyard and a large roof terrace with views of the Atlas Mountains make the guest believe he was in his private oasis – and in some ways the true indeed. Yvonne Hulst and Roberto Cortes have luxury villas in Ibiza operated before they discovered the little riad in the medina of Marrakech and it became a small “fairy tale hotel” created with a personal touch. The Riad is located away from the airport despite the central location only 20 minutes by car. Also two great golf courses are within easy reach from Ryad from Dior. Each of the seven rooms and suites has a character all its own, but has king-size beds, yoga equipment and even its own DVD collection for cozy movie nights. In addition, always a plate of fresh fruit is served. The golden through and through “Superior Suite” with fireplace, two bedrooms, free standing bath, private lounge area and private access to the roof terrace is undoubtedly the flagship of the riad. The fine and beautiful paintings, which are on the five-meter high ceiling, more than 300 years old. In each room there is a fireplace for those cold nights and a lot of Moroccan art to discover. Marrakech experience without Hammam – unimaginable for Moroccans and lovers of culture. Therefore, there is of course the Ryad Dior private hammam, massages and other spa treatments in addition such as manicures or pedicures are offered in the. Children are welcome in the way Ryad Dior and welcome guests. If the parents want to take a trip for two, there is for the children a babysitting service. Pets are also at Ryad Dior no problem, but should be specified when booking.